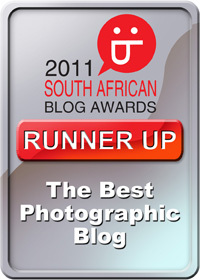 In South Africa, recycling is way of life that not very many people incorporate into their daily routine. Partly because we do not have the facilities or many places that offer this service, but mainly because most people are too lazy to think about what happens to their rubbish once they toss it in the bin. So instead of carelessly dumping your trash, one of the ways you can help give used things a second life, is to reuse your glass jars, and use them as novelty photo frames. After speaking to several people in search for the best method to remove the gluey sticky mess left behind when attempting to soak off labels on glass jars, I have discovered the secret is… Doom. No, I’m not referring Dr Doom the super villain from the Marvel comics, but rather the insect killing spray of death. Simply spray a thick coat of Doom onto the stickiness, wait 5 – 10 minutes, and then effortlessly wipe away the glue with a kitchen towel. Rinse with hot water and soap. Easy as pie. Using your ruler, measure the height of the flat part of the jar (the part excluding where the bottle curves) – this is where the photo will fit. 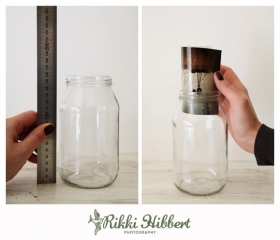 Using your ruler, knife and pencil, trim the height of the photo neatly, to fit the height of the flat part of the jar. Slightly roll the photo, with the image facing outwards, and insert it into the jar upside down. You may need to adjust it with your fingertips so that it fits snugly into its new home. 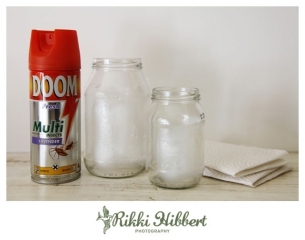 Turn the jar upside down, so that it rests on its opening, and display it somewhere special! 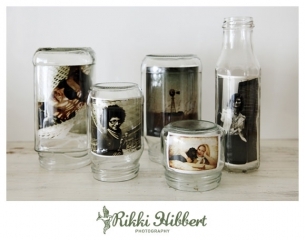 Use a selection of different shaped jars with different heights to create interest. 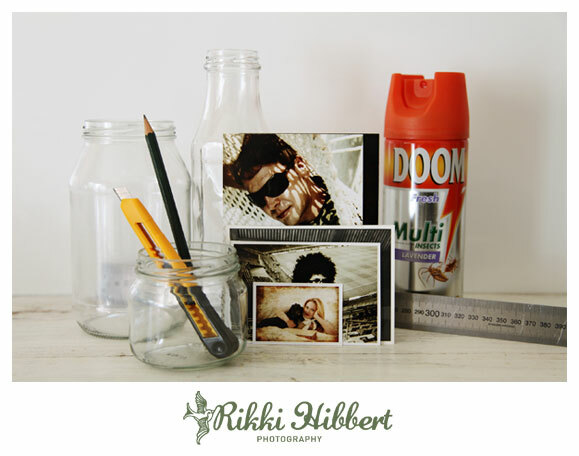 You can also use glass bottles, although this is a little trickier as you will need to roll the photo tighter, and make sure the height of the photo is as tall as the widest part of the bottle. When using bottles, do not place the photo inside down. If you liked this photo craft, then also check out how to make recycled frames from CD covers. Bilderrahmen aus dem Glas — zappalot.